MEDITE SMARTPLY, producers of innovative timber panel products, has launched an interesting new app for its SMARTPLY product range. The ‘SMARTPLY AR’ app, which is live on iOS and Android, features a ‘Product Data Tool’ providing a comprehensive breakdown of the entire SMARTPLY product range. The tool includes detailed information that is broken down into easy to digest sections, making it ideal for reading on the go and a useful companion when selling, specifying or using SMARTPLY products. In addition to the Product Data Tool, the app also includes a ‘Forest to Factory’ feature, a 3D augmented reality, step by step walk through the company’s manufacturing process. 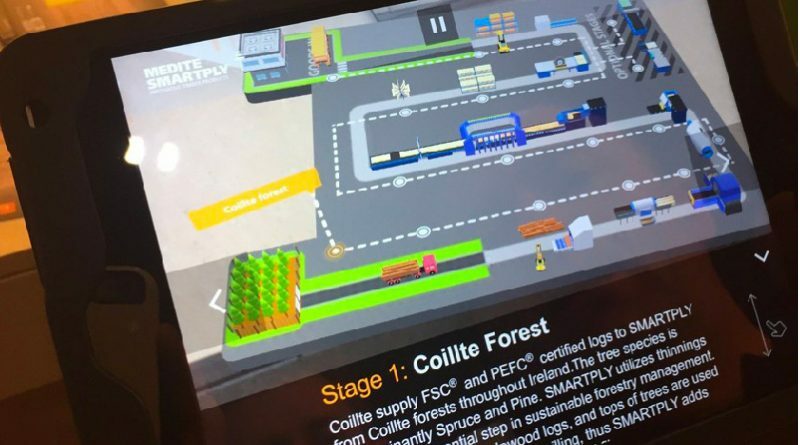 The visualisation takes you all the way through the supply chain, from the sourcing of raw material from the company owned forests, right through to the products being loaded onto a lorry and being delivered to the customer. “Our new SMARTPLY manufacturing facility and our sustainable supply chain are things we are extremely proud of”, says Stuart Devoil, Head of Marketing and Brand at MEDITE SMARTPLY, “It’s great for our audience to now be able to see exactly how much goes into producing our products to such a high standard. Seeing the procedure so clearly documented provides the chance to see exactly how we operate and really brings the process to life. The app is available to download from the Apple App Store and Google Play now. Simply search for ‘SMARTPLY AR’, then use the infographic here or download and print a copy from the ‘downloads’ section of the website http://www.smartply.com/downloads or click here.